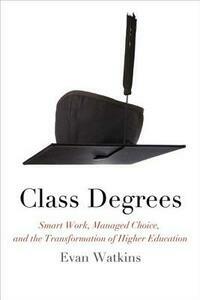 A current truism holds that the undergraduate degree today is equivalent to the high-school diploma of yesterday. But undergraduates at a research university would probably not recognize themselves in the historical mirror of high-school vocational education. Students in a vast range of institutions are encouraged to look up the educational social scale, whereas earlier vocational education was designed to "cool out" expectations of social advancement by training a working class prepared for massive industrialization. In Class Degrees, Evan Watkins argues that reforms in vocational education in the 1980s and 1990s can explain a great deal about the changing directions of class formation in the United States, as well as how postsecondary educational institutions are changing. Responding to a demand for flexibility in job skills and reflecting a consequent aspiration to choice and perpetual job mobility, those reforms aimed to eliminate the separate academic status of vocational education. They transformed it from a "cooling out" to a "heating up" of class expectations. The result has been a culture of hyperindividualism. The hyperindividual lives in a world permeated with against-all-odds plots, from "beat the odds" of long supermarket checkout lines by using self-checkout and buying FasTrak transponders to beat the odds of traffic jams, to the endless superheroes on film and TV who daily save various sorts of planets and things against all odds. Of course, a few people can beat the odds only if most other people do not. As choice begins to replace the selling of individual labor at the core of contemporary class formation, the result is a sort of waste labor left behind by the competitive process. Provocatively, Watkins argues that, in the twenty-first century, academic work in the humanities is assuming the management function of reclaiming this waste labor as a motor force for the future.